When most people think about the students we serve at the Department of Education, they probably envision small children sitting around their teacher for story time, middle school students working in a science lab or even teenagers tossing their caps at graduation. Many Floridians don’t realize that while K-12 education is a critical component of our work, the Florida College System is a vital part of our department and our state’s public education system. Since Governor Rick Scott proclaimed April as Florida College System Month, I thought I would take this opportunity to tout the great work of the Florida College System, which has become a national model in preparing students for success in careers and in life. With more than 800,000 students at 28 schools, our colleges provide high-quality, affordable education options that fit the needs and schedules of all Floridians. I’m proud to report that our hard work is paying off – nine out of 10 Florida College System graduates are employed or continuing education after one year of graduation and 93 percent of Florida College System students remain in Florida and contribute to economic growth. Our schools have been recognized as being among the best in the nation. Just this month, The Aspen Institute announced the 2015 winner of the Aspen Prize for Community College Excellence. Of the 1,000 colleges around the country considered, two Florida colleges – Santa Fe College and Indian River State College – were among the top 10 finalists. Ultimately, Santa Fe College received the prestigious award, which included $800,000. I want to congratulate both of these schools and all of their students and faculty for their hard work. Of course, we know that in order to benefit from great college programs, students must be able to afford to attend, and I am pleased that Florida has made great strides in this area as well. All of our schools with baccalaureate programs accepted Governor Scott’s challenge to offer $10,000 degree programs. In his “Keep Florida Working Budget,” Governor Scott takes his commitment to college affordability even further with proposals to expand Bright Futures scholarships to include summer classes, eliminate sales taxes on textbooks, hold the line on tuition and enhance transparency regarding courses. I am grateful for these efforts to help all Florida students reach their academic and career goals with less debt. In honor of Florida College System Month, we are hosting several events throughout April, and I encourage any interested Floridian to participate. I am especially thrilled that Lieutenant Governor Carlos Lopez-Cantera will be the keynote speaker at the Florida College System Student Government Association’s Opening Session on April 8 in Tallahassee. To learn more about the Florida College System and the events we have planned throughout April, please visit http://www.floridacollegesystem.com. Learning advanced STEM skills is critical to students’ success both now and in the future. Try to remember a day at school or at work where you didn’t use a smartphone or tablet to help keep you organized and connected and accomplish your tasks. While it’s tough to remember, these vital tools have been in our pockets and briefcases fewer than 10 years! Can you imagine a world where scientists can make building materials resistant to termite damages by engineering trees that termites cannot digest? All of these life-changing tools and resources are possible because people in STEM-related career fields not only had the knowledge and skills, but also possessed the creativity and motivation to make our world a better place to live. The future leaders and innovators of our state are sitting in our classrooms today. As educators, it is our job to ensure that students have the access to STEM education so that students have the ability to fill jobs – and create new jobs – in the workforce of tomorrow. But there are many jobs today that did not exist five or 10 years ago, and the workplace will continue changing rapidly in the near future. That’s why we also have to help Florida students prepare for college and career through strong academic standards that develop critical-thinking, problem solving and communications skills. The Department of Education has made it a priority to ensure students have access to high-quality STEM education opportunities. In the past five years, we have increased enrollment in accelerated STEM courses by 46 percent, allowing more students to discover the possibilities of careers in STEM-related fields. Governor Rick Scott has been a strong leader for STEM education in Florida. • $1 million to facilitate partnerships with high-tech Florida companies. These investments are important to help students be prepared for success now and in the future. 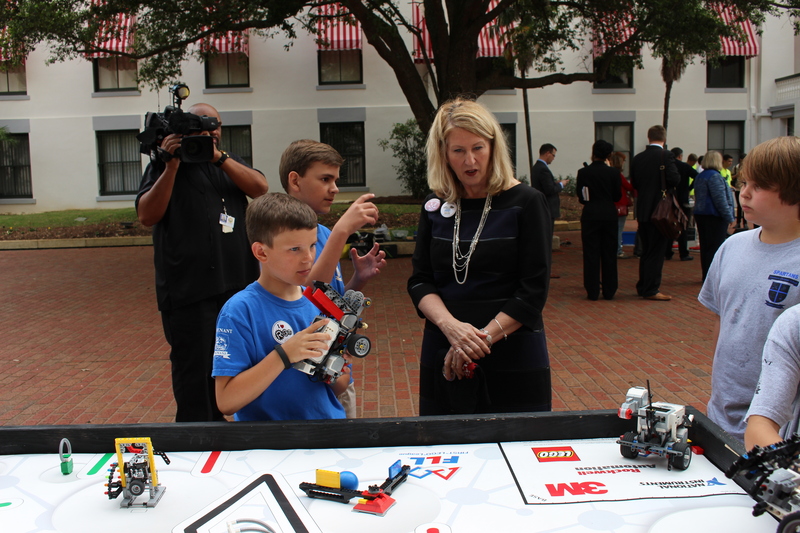 Today, I had the pleasure of joining Florida students in the Capitol Courtyard for STEM Day at the Capitol. Students showcased their talents through the demonstration of robots and solar vehicles they created. I enjoyed spending time with these incredible students. I’m also grateful to the teachers who take the extra time – inside and outside of the classroom – to provide these students with the skills and support they need to get a quality education and learn important STEM skills in the process. 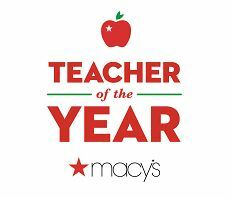 For more than 25 years, the Florida Department of Education and Macy’s have celebrated teachers and teaching through the Florida Teacher of the Year program. 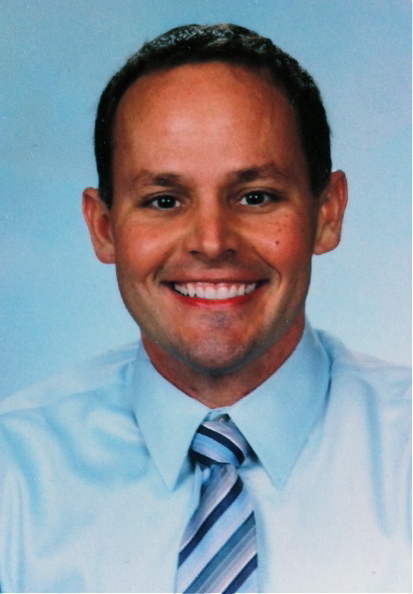 Each school district and local education agency in the state nominates one Teacher of the Year to attend a recognition gala and professional development conference. From among these accomplished educators, Florida’s Teacher of the Year is named and on his or her way to a year-long mission to advocate for our state’s outstanding students and educators. The department’s Commissioner of Education, Pam Stewart, challenged us this year to take our work with these phenomenal educators to the next level. She envisioned a year-long professional learning opportunity that would invite each district Teacher of the Year to take on the challenge of improving student outcomes in a classroom that is not his or her own. We invited this year’s honored educators to step out of their classrooms and become leaders within their community and across the state, something many were already doing. Department staff partnered with the New Teacher Center, a national leader in the area of professional development and support, to give these teachers the tools and resources they need to lead their peers. Through the partnership, we created the LEAD network, a year-long program for the Florida’s district Teachers of the Year that included two in-person meetings and five online learning forums. During the program, each teacher created an action plan in one of two areas: leading a group of educators in a Professional Learning Community or individually coaching new teachers. With tools and blended staff support, our LEAD teachers are able to increase student achievement through helping their peers. At our most recent in-person meeting, we learned many of our LEAD teachers have taken the work we started this summer developing “growth mindsets” back to their schools or districts. Several, for example, are leading year-long book studies with Carol Dweck’s Mindset as the key text. We’ve also heard from many educators on how much they value the LEAD network. One participant commented that, as a result of this year’s LEAD Network, she has done “more sharing this year than all of her 26 years in education.” Another commented that she feels like she is “in a room full of giants,” every time the group comes together. As a result of Commissioner’s Stewart vision, the department is changing its strategy for working with teachers, opting for deeper and more sustained communication so the impact of these educators can extend far beyond their own classrooms. We are also modeling our programs so that local school districts and other organizations can see what teacher leadership means to the department and why it is important. Taking on the challenge of ensuring college- and career-readiness for every Florida student is an enormous challenge, a great opportunity and our moral responsibility. However, we cannot prepare students if we don’t acknowledge Florida’s teachers as our partners and as community leaders. The Teacher LEAD Network is our proud contribution to celebrating and advancing the profession of teaching. Each time I work with these honored educators, I can’t help echoing the thoughts of one of our participants and feeling lucky to work with such educational giants. 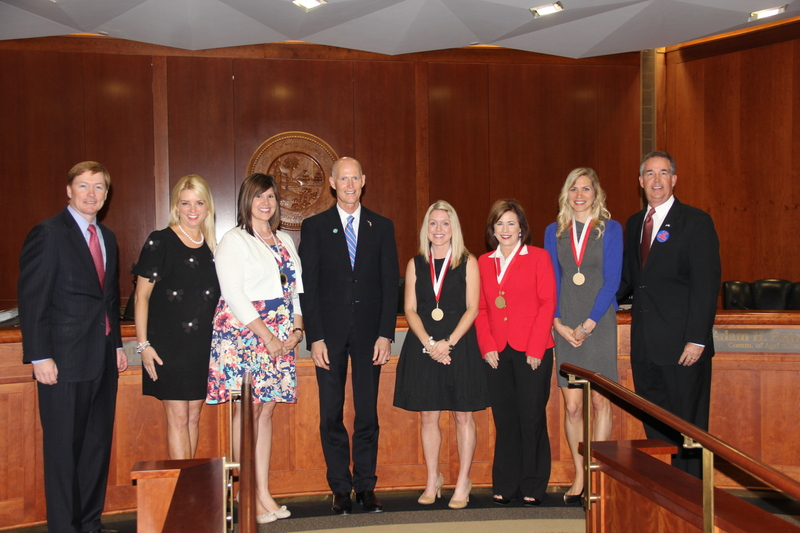 During a meeting of Florida’s Cabinet, Governor Rick Scott presented Governor’s Shine Awards to four outstanding teachers from around the state for their commitment to Florida’s students. The Governor’s Shine Award is presented to Florida educators and administrators who make significant contributions to the field of education. Allison Gamblin, Citrus County, Crystal River Primary School – Allison Gamblin has been teaching for five years, and is currently teaching fifth grade in Crystal River. Allison believes that teaching is her calling and she works hard to create lessons that match each child’s learning styles and interests. She strives to make a difference in all of her students’ lives, and helps students succeed though classroom management and small groups. Allison sets high expectations for her students and enjoys seeing them succeed each day. Allyson Howell, Calhoun County, Blountstown High School – Allyson Howell has been teaching for 20 years, and currently teaches math at Blountstown High School. She was recently selected as the Calhoun County School District’s Teacher of the Year. Over the past 15 years at Blountstown High School, Allyson has also taught two dual enrollment courses- pre-calculus and trigonometry. Two years ago, she was recruited to teach the same courses via distance learning for Altha School and Liberty County High School. She serves as the sponsor of the Senior Class and National Honor Society, and is the school’s math coach. Vickie Plant, Jackson County, Golson Elementary School – Vickie Plant has been teaching kindergarten for 11 years, nine of which have been in Jackson County at Golson Elementary. She has a strong desire to instill a love of learning in all children and to see them be successful in building the foundations of their education. Vickie enjoys being a leader in her school and district, and has done so through various experiences, including hosting teachers from surrounding school districts, serving on the International Literacy Association, and being a member of the Florida Council of Teachers of Mathematics. Christy Russel, Gilchrist County, Trenton Elementary School – Christy Russel is a kindergarten teacher at Trenton Elementary and was recently recognized as Gilchrist County’s District Teacher of the Year. She is described by her peers as an energetic, motivating and outstanding teacher whose impact reaches far beyond the walls of her classroom. Christy sees the potential in every student, and constantly searches for innovative ways to reach each student in her classroom. Christy also strives to help parents understand how their child is progressing in their education. Good nutrition in childhood helps prevent many health problems, including obesity, tooth decay, osteoporosis and iron deficiency. National Nutrition Month is a wonderful time to adopt healthy eating and increase physical activity plans that are focused on consuming fewer calories, making informed food choices and getting daily exercise in order to achieve and maintain a healthy weight. Here are five tips for you to try during the month of March to improve your family’s health and well-being. 1: Start Good Habits Early. According to the Florida Department of Health, one out of every three kids is now considered overweight or obese. Offering a variety of healthy foods and encouraging kids’ natural tendency to be active can help set them on a path to making healthy decisions throughout their whole lives. 2. Research Florida’s Seasonal Fruits and Vegetables. Eating healthy doesn’t have to break the bank. Choosing foods that are at their seasonal peak often cost less at the grocery store and taste better at the dinner table. The Florida Department of Agriculture and Consumer Services created the Living Healthy in Florida initiative, which highlights fresh Florida fruits and vegetables. To learn more about healthy, nutritious foods and how to access free resources, visit www.LivingHealthyinFlorida.com. 3. Model Good Eating Behavior. Children will be more likely to try new, healthier foods when they see their loved ones do so. Let your child see you pick out your favorite vegetables or fruits at the grocery store and make sure to describe the food’s taste, texture and smell. For more resources, visit http://www.choosemyplate.gov/food-groups/downloads/TenTips/DGTipsheet12BeAHealthyRoleModel.pdf. 4. Make Better Beverage Choices. It is very easy to ruin a day of health eating with a high calorie, high sugar drink. Instead, try sipping water throughout the day or at mealtime. Sodas, sports drinks and even juice drinks usually contain a lot of added sugar, which contains additional, unneeded calories. 5. Find Out What Your Child is Learning about Nutrition in School. 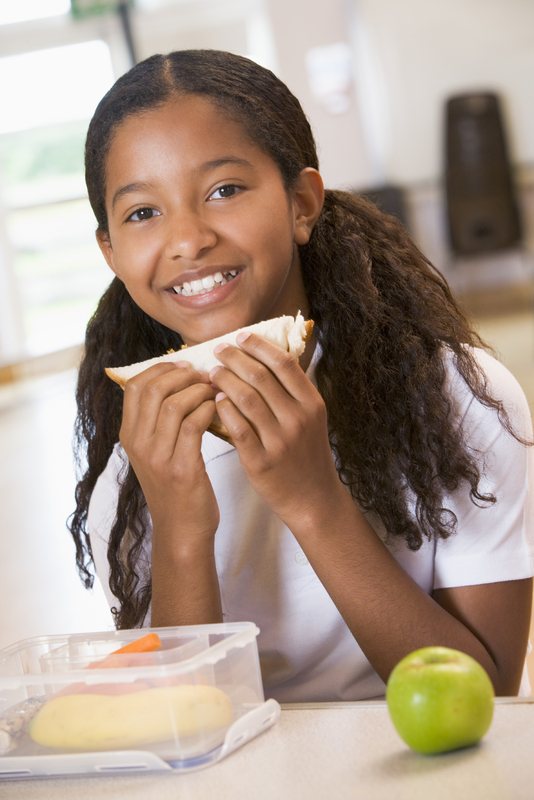 Nutrition is a required component of K-12 Health Education in Florida. To find out what your child is learning, talk to his or her teacher or school about the health curriculum and nutritional programs. There are also many free resources online that you can share with your child, including the U.S. Department of Agriculture’s parent-friendly website (http://www.choosemyplate.gov/) that offers tips and free materials to help parents and children make healthy choices while staying within your budget. Each day, your food and physical activity choices affect your health and your children’s health today, tomorrow and in the future. To learn more about strategies and activities designed to help Florida’s children and adults make choices about healthy eating and active living, please visit http://www.healthiestweightflorida.com/children.html. About the Author: Michelle L. Gaines serves as the Florida Department of Education’s Health Education Coordinator since 2012. The Arkansas native is a mentor, an avid community volunteer and an educator for 25 years. Michelle can be reached at Michelle.Gaines@fldoe.org. Today, Education Commissioner Pam Stewart and Florida Department of Law Enforcement (FDLE) Commissioner Rick Swearingen announced that FDLE is investigating testing delays caused by cyber-attacks on a server used to administer the Florida Standards Assessment (FSA). Education Commissioner Pam Stewart said, “While most Florida students are continuing to test successfully, we now know that some of the delays in testing late last week were due to cyber-attacks on our testing system operated by American Institutes for Research (AIR). The Department has been working with FDLE since last Thursday when we were notified about the problem and we will continue to provide them with any information possible to ensure they identify the bad actors and hold them accountable to the fullest extent of the law. We are holding daily conference calls with AIR to ensure they immediately address any flaws or attacks on our system as we move forward in this second week of testing. On Monday, March 2, Florida’s eighth, ninth and 10th grade students began taking the computer-based writing component of the English language arts Florida Standards Assessment. At the start of the two-week testing window, districts experienced a number of technical difficulties unrelated to the cyber attack. This includes delays because test administrators could not log in, and students being logged out of the test prior to completion. This resulted in some responses being temporarily unavailable to the students. Commissioner Stewart directed AIR, the organization delivering the tests, to determine the cause of the issue and immediately resolve it. AIR accepted full responsibility and concluded that an update it performed had inadvertently resulted in the delays. AIR has had success retrieving student responses and AIR is researching and resolving the remaining cases. By Tuesday afternoon, the issue with the log on server was resolved. While there were some sporadic reports of denial of service on Monday and Tuesday, significant concerns of an attack did not occur until Thursday morning when DOE received widespread reports from a number of districts of “white screens” after logging in. By approximately 8:30 a.m. Thursday, the problem had subsided and the districts that continued were able to test successfully for the rest of the day. AIR confirmed the cause of this issue was a cyber-attack on the log on server. Commissioner Stewart, upon learning about the cyber-attack, immediately contacted FDLE and requested the agency to investigate this issue and hold those responsible accountable. According to AIR, the cyber-attack that caused a denial of service will not compromise student performance on the test or any personal student data. Despite these issues, in the first week of the two-week testing window, a total of 397,352 students completed the computer-based writing component, which represents more than 60 percent of students registered to take the test. Last week, at Dr. Philips High School, Governor Rick Scott presented 111 schools in Orange County with $10.3 million in school recognition funding. Governor Scott announced yesterday the distribution of more than $124 million in School Recognition Program funding this year to Florida’s high performing schools across the state based on sustained or significantly improved student achievement. Governor Scott presents Dr. Barbara Jenkins a check for more than $10M in school recognition funding for 111 schools in Orange County. Governor Scott talks with students at Phillips High School in Orange County. View Governor Scott’s release announcing the statewide distribution of the School Recognition Program. For more information on the School Recognition Program, visit http://www.fldoe.org/accountability/accountability-reporting/fl-school-recognition-program.